So this weekend was my first London Fashion Week! After several seasons of attending the Milan shows, I was pretty curious about what London had to offer - and after several seasons of checking out the FROWs on style.com with badly concealed envy, I finally managed the impossible: to get myself invited to a few shows. How did I do it? Simple: I emailed the PRs of every - literally every - show I wanted to go to (not the impossible ones, I didn't even try Burberry or Tom Ford) during the weekend, told them about Vilda and asked for tickets. Of the "official" LFW shows (the ones that go on Style.com) only one actually sent me an invitation, but it was the best one - Topshop Unique. Aside from that one golden ticket - standing, obviously, but it IS my first time at LFW - my tip for everyone wanting to get into LFW is: go for the Fashionscout shows. This piece of advice was given to me by Poppy, my Marie Claire mentor, and I'm so glad I followed it. Not only was it easy-peasy to get tickets, but Fashionscout is truly an amazing platform for creativity and innovation in fashion. I had an incredible time there. I don't know if I should advise even more people for next season, as it was super-crowded already, but if you want to go to Fashion Week, the Scout shows are an amazing place to be. I started off my Fashion Week-end on Saturday by...missing my first 10.30 show. I'm a bit ashamed to admit this, as it was in Southbank, which is pretty close to my house. I got lost searching for the exact location and showed up at exactly 10.36, along with what looked like a herd of incredibly stylish fashion students, only to witness a sight as rare as the white tiger: possibly the only fashion show known to man to EVER start exactly on time. Oh well. I didn't waste any time crying over spilled Charlie May invites (it did look like a pretty cool collection, from what I could gather pressing my nose up against the glass doors) and dashed off to Holborn to avoid missing my following shows. On arrival, I was whisked quickly into the the lounge, where heaps of complimentary popcorn and coconut water awaited. Had I known this would be the only thing even vaguely food-related that was coming my way all day, I would have seriously (and rather unashamedly) loaded up. Whereas now, I demurely helped myself to one of each (big mistake. More on this later). The first show was Yifang Wan - as one of the first people in the queue and since it appeared that we were welcome to sit wherever, I shamelessly plunked myself on the front row (after seasons of standing, it was a small victory), where a goodie bag awaited, containg The Body Shop lipstick and microdermabrasion masque, a haircare set, another bottle of water and Propercorn bag and a Toni & Guy magazine - very generous, but then there are few things I love as much as goodie bags. The collection was drop-dead beautiful - all rich, muted shades, exquisite cuts and elegance, elegance, elegance. I wanted to wear it all. The Min Wu presentation that followed featured beautiful degrade shades and pencil skirts - and free bubbly. Little did I know this was the first of many drinks (and little food) to come. Subsequently, I plunked myself on my next front row - Xiao Li. Right in front of me was Susie Lau (yes, she of Susiebubble), fantastically dressed but looking like a very normal girl, someone you'd like to befriend. Her making an appearance tipped me off to the importance of this show, and my impression wasn't wrong. Xiao Li was one of the highlights of this season's LFW in general, not just Fashionscout. To the sweet tune of Daughter's fantastic cover of Get Lucky, pink-haired models floated down the catwalk in icy pastels teamed with contrasting blues, delicate cut-out designs and airy, unconstrained volumes. Amazing. Beyond amazing. When the last girl's LED dress lit up the catwalk, I was reminded of how beautiful fashion is and what attracted me to this industry in the first place. But the magic vanished swiftly when we were forced to queue outside in the cold for the next show, Zeynep Kartal. I may be a LFW newbie with a much too simplistic mind, but once you're inside the venue, doesn't it make more sense to just stay there? Not according to the Fashionscout organisers, who had their guests freeze for about half an hour before starting to call people back in according to a rather intricate system consisting in a guy walking up and down the queue yelling, "who's got a gold star on their invite? A silver star? A blue star?" It was clear that I, with my orange circle, was everything but a star. Right when my fingers were turning blue in the February chills, we were finally let in. Luckily, the show made up for every minute waiting. Sparkly evening elegance was the word and I started regretting already having bought my wedding dress! I also loved the poufy hair and dramatic makeup. By the time Zeynep was over, I was getting hungry, but since Bernard Chandran was starting in mere moments, there was no time to rush to Eat for a quick salad. I was the only one who seemed bothered by this: the rest of the fashionable set didn't seem to mind. I took another sip of coconut water and got ready for grown-up colour blocking and daring leather-meets-glitter (fare more classy than it sounds) ladylike stylings of Bernard. The most badass work-to-cocktails wardrobe ever? I don't know how much you know about Ucrainian fashion, but Kiev didn't even figure on my style map until the Kiev Fashion Days show. Featuring dynamic designs, creative colour plays and possibly the best knits I've recently seen, it truly impressed me, although I was somewhat distracted by the two Italian girls standing behind me, presumably thinking no one could understand them. I was very amused by their gushing, which I couldn't help but overhear. It transported me back to my fashion school days, when I went to shows and found absolutely everything "sooooo gorgeous and amazing!!" I wouldn't have been quite so quick with the laughs if I had known that another thirty minutes of freezing was ahead before I could enter the Liz Black presentation. Really guys, this is something you should work on for next season. I regret to say this, but by this time (around 4.30 pm) I was so hungry that I attacked my sweet and sour popcorn out in the cold (I apologise to any streetstyle photogs who have to deal with Photoshopping a popcorn-munching bystander out of their stylish pics of more chic fashion show-goers). The kind folks at Liz Black must have figured we (well, I) were getting hungry, so they helpfully offered a big bucket of Chupa Chups at the bar. Note to Fashionscout: next year, go for nachos! With vegan cheese! I nixed the lollipops and went for the Pimm's instead, as if I weren't a bit drunk already. The presentation was amazing - the set was inspired by Salvador Dali and Mae West, as was the seductive and sophisticated collection. Off we dashed to Belle Sauvage - the most crowded show I've ever been to. I was able to get a place right next to the photographers, so if it wasn't for the masses of people in front of me, my photos might have turned out quite good. Instead, I caught only the top half of the decadent, print-rich and opulent collection. That was a wrap for me for Saturday, but I didn't leave without losing my favourite black snood scarf - I miss it a lot, but also hope we're heading for a season where scarves are no longer needed...soon? Semi-soon? Sometime in the distant future? On the bus home, I called David to ask him to "make a lot of food" as I was drunk and starving. His reply was, "okay, and oh yeah, you got an invite for Topshop Unique tomorrow." I nearly fell down the bus steps. For future reference, this is not something you just spring on a girl. You have to give me time to digest this. To imagine at least five potential outfits. To stop and appreciate the magic of life and Fashion Week. Out of all the PRs I had contacted, only one non-Fashionscout had replied, but it was the BEST one. This sunny Sunday, I headed to Tate Modern to grace the Topshop show with my presence. So did Kate Moss, Anna Wintour, Poppy Delevingne, Kendall Jenner, Daisy Lowe and one of my personal style icons, Leigh Lezark. So yes, it was pretty star-studded, I won't lie. For those of you that follow personal style blogs, I can also report that I saw Carolina from Fashionsquad and Andy from Style Scrapbook. The collection itself was MADNESS - one of the best at LFW. Gorgeous layering, exquisite knits and the best fake furs I've ever seen - vegans, rejoice, Topshop's faux furs are genius. I'm definitely getting one next year. The good girl gone "adventurous", with Beyonce's Who Run the World (Girls) closing the show, it was such an epic LFW moment. After the show I unexpectedly found myself thisclose to Leigh Lezark and I can tell you that unfortunately, the dire truth is that celebrities in person are just as flawless as they appear in pictures. And even skinnier: Poppy Delevingne, while heart-wrenchingly beautiful (am I the only one who kinda prefers her to Cara?) is a twig and blogger Andy Torres is thinner than most of the models in the show. I wouldn't be surprised if many of these people's photos are actually "fattened" with Photoshop. After my customary glass of bubbly, I witnessed the pure style magic of Jourdan Dunn getting into a car and even she wasn't as thin as some of the aforementioned, although so gorgeous that it hurt to look directly at her. Monday after work, it was time for my final LFW appearance - and a rather special one. 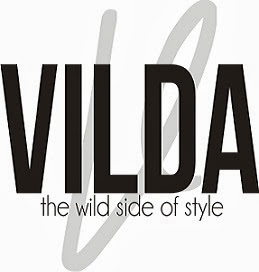 As the editor of Vilda, I was invited to the EcoLuxe sustainable fashion show, which was a true honour! Needless to say, I downed not one, but TWO glasses of wine pre-show (turns out, "would you like some wine, madam?" is one of the most dangerous things you can say to me. Especially on a cold February post-office Monday night. I'll be so grateful, I won't even take notice of having just being called "madam"). The event itself was presented by one of the EcoLuxe founders, a designer, who talked us through the many collections and brands featured. Most of the designs were amazingly beautiful and on-trend, but as always I have issues with "eco leather" (NO. SUCH. THING. period) or "sustainable silk" - it's still dead animal, people, it doesn't matter how you dye it. If it's cruel, it can't be sustainable! And don't get me started on the whole "eco fur" concept - even though I do understand the whole "fur from roadkill" idea, ultimately I feel that all it does is raise demand for real fur. But I very much appreciated the rainwear, yogawear and cork accessories! 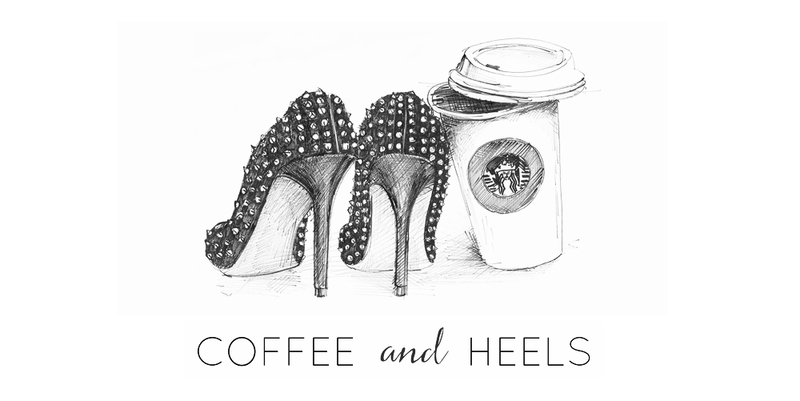 After the show, I was approached by two girls: "excuse me, are you Sascha from Coffee and Heels?" For a moment there, I was too drunk to remember, but indeed I am, and this was my first time getting recognised! 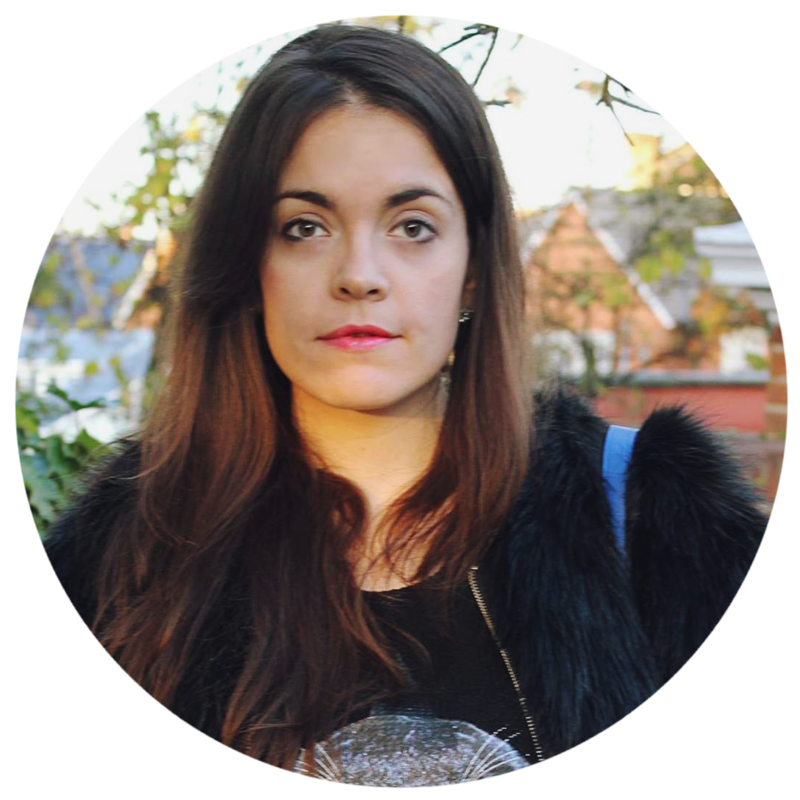 The two ladies were none other than Lucy from Atelier Tammam and vegan designer Natasha Andreicheva, who came up to talk about my blog and Vilda. It was a really heart-warming little moment, finally experiencing my fifteen minutes of "fame"! The goodie bag was to die for: face cream, sun powder, hair oil, press info on all the brands, an energy drink, a pen and much more! Very generous. And this concludes my LFW experience. As the fashion circus moves on to Milan, I can say I'm happy with my first London Fashion Week - and hoping to repeat it all in September!